Applications open for 2017 Muslim Exchange Program (MEP), funded by the Australian Government through Australia-Indonesia Institute and in cooperation with Paramadina University. The MEP program provide opportunities for Indonesian youth to take part and experience the practice of Islam and other religion in Australia. This program aims to enrich participants’ knowledge on Australian multi-cultural environment. Submission deadline is 16 December 2016. More information can be found through the website of Paramadina University and Australian Embassy in Jakarta. Source: Grigson, Paul. 2016. Dibuka pendaftaran program pertukaran Tokoh Muda Muslim 2017 in @DubesAustralia [Twitter]. 27 Nov. Available from https://twitter.com/DubesAustralia. [Accessed 27 November 2016]. The group is established in 2013 by Kajian Islam Adelaide/Islamic Study of Adelaide (KIA) to promote Rebana (tambourine) as one of traditional music that associated closely with Indonesia Muslim community. Although Rebana is traditionally played to praise God, and the Prophet Muhammad SAW,the group has been combining its performance by playing it on Indonesian traditional songs too. The group consist of 10 to 15 players that are mostly Indonesian postgraduate students living in Adelaide. The group have been performing in many places and popular events/festivals in Adelaide such as the Art Gallery of South Australia, Migration Museum, OzAsia Festival, Moon Lantern Festival, Night Noodle Market, Indofest, Flinders University’s 50 Years Celebration, and many more. Besides promoting Islamic culture, Rebana has been also widely used to strengthen people to people relationship and mutual understanding between Indonesia and Australia by joining school visits program and cooperation with many institutions in Australia. Suryo Guritno, PhD Candidate from Flinders University, will be representing El Musafeer in the 3rd Indonesia Research Day Cultural Panel to share his experiences as a former coordinator of the group. After first being introduced to Indonesia and its music at Flinders University, Brett has gone on to spend the last five years living and studying in Indonesia. His hobby of music and it’s social importance for local communities has seen him spend time in Java, Jakarta, Kalimantan and most recently West Sumatra studying not only the music but also languages and cultures of these areas. This interest has followed Brett back to Adelaide where he has recently taken on role as Artistic and Cultural Director for Indofest Adelaide 2016. Through this role he has been able to engage with many different community groups as well as form his own group with the focus of strengthening Australia-Indonesia relations through collaborations of local Indonesian art forms developed and performed here in Australia. For most Indonesians, Rugby may not be a popular sport just yet. However, this is not the case for Daniel Nugroho. Rugby has captured his interest since he was 15 years old and eventually brought him to spend 2 years in Australia playing for the University of Queensland Rugby Football Club (UQRFC) in Brisbane. To date, Rugby in Indonesia has seen growth in popularity and growth among Indonesian players. There is currently 16 active Rugby Clubs across Indonesia. The Indonesian Rugby Football Union (IRFU) established in 2004, changed the trend for Rugby in Indonesia, from a sport that is dominated by expats to a sport that is popular among Indonesian youth. More details can be seen here. GoLive Indonesia caught up with Daniel Nugroho and asked him to share his experiences and memories on playing Rugby in Brisbane, and what this experience meant for his personal development and rugby in Indonesia. Daniel’s achievement in Indonesian Rugby can be seen here. Daniel is currently playing for Jakarta Komodo Club. Growing up in Indonesia, where “rugby” is an unfamiliar word, makes it sounds like an extraordinary sport. 80% of the people that I’ve met thought that it was an American Football, a sport that is played using an oval shaped ball and pads. Well, it is not. I started playing rugby back in 2004 when I was 15 years old in Jakarta. Then I got really caught up, that I finally made it to the national team in 2006. After gaining more experiences by playing in both local and international matches, I was finally got selected to become the national team captain in 2012. After 8 years of experience and trusted as the national team captain; I felt like I had achieved a target. However, I still wanted to improve. I wanted to play at the higher level, therefore I decided to quit my job and move to Brisbane, Australia to join the local rugby club. Things in Brisbane started off just right. 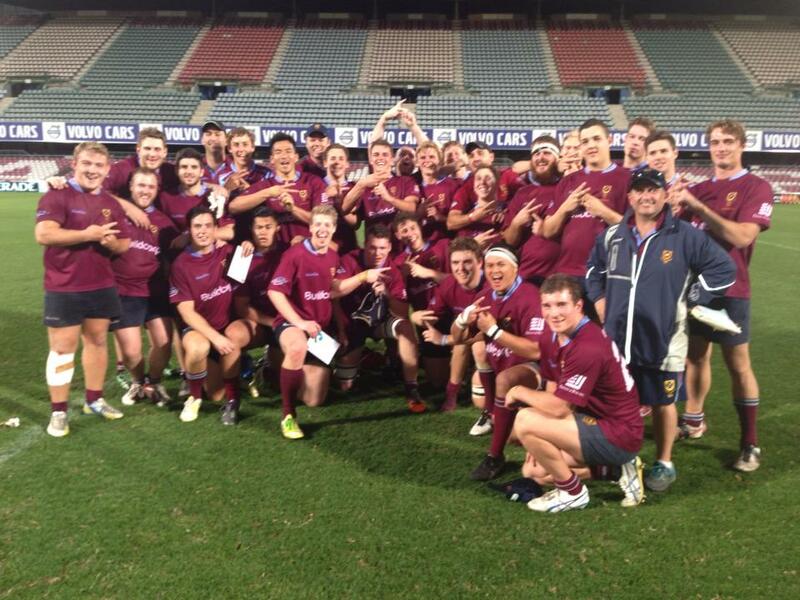 As soon as I got there, I joined the University of Queensland Rugby Football Club (UQRFC), one of the most successful Brisbane rugby clubs that has won 24 First Grade Premierships since 1911. 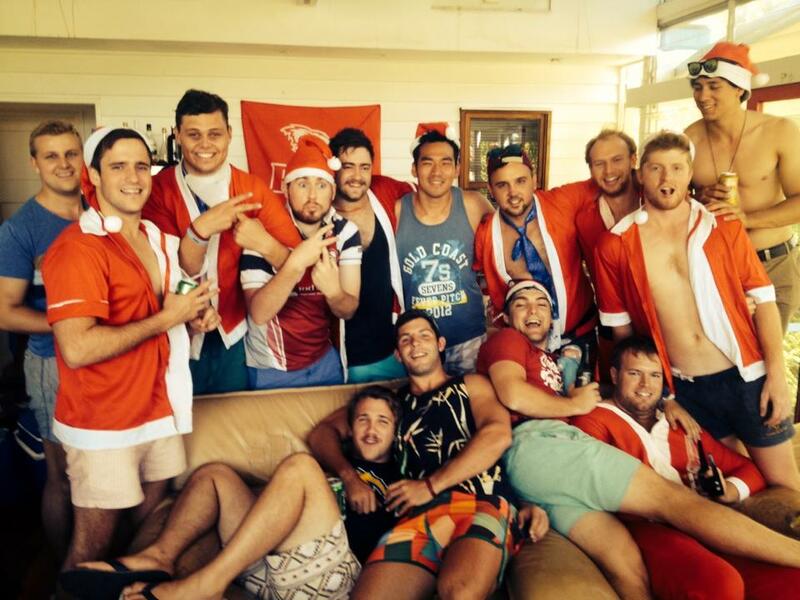 I could say that I was one of the very few lucky Indonesian lads who could join the team and play rugby in Australia. Training and preparation was taken more seriously in Australia. Every player was required to join a pre-season fitness training to be considered for the grade team selection. They never had players’ shortage issue, so every individual needs to put their commitment on and off the field to compete with one another for a place. Pre-season training and fitness was intended to filter players, then a pre-season match was conducted between team-mates to determine the grade placement. Players who weren’t well prepared would start the season in the lower grade. Tunnel entrance before the Grand Final match at Ballymore Stadium; UQRFC 4th grade line up for the Grand Final. 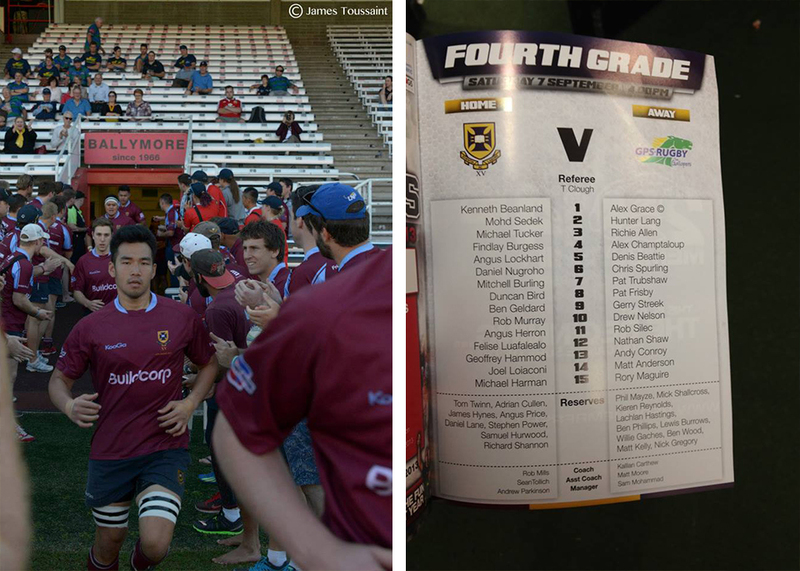 There are 7 men’s senior teams in University of Queensland Rugby Football Club (UQRFC): one premier team, and followed by the other six teams from the 1st to 6th grade. 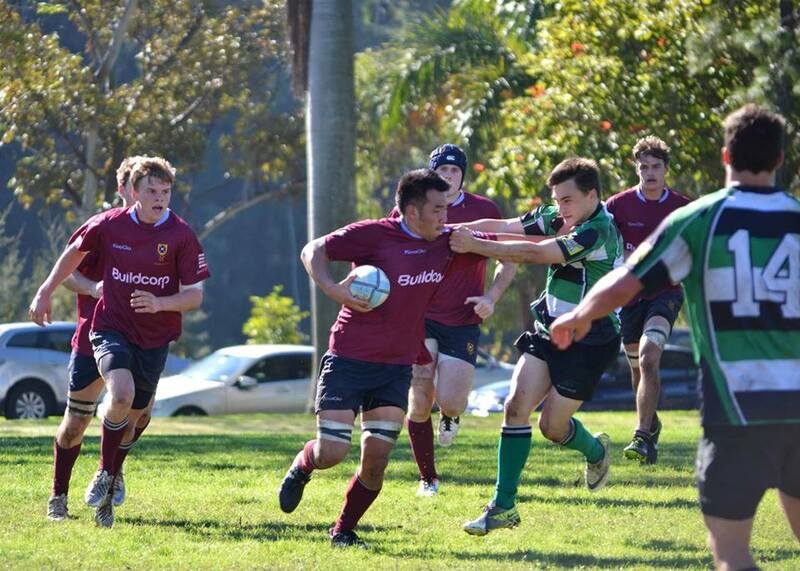 I started playing with the 6th grade when I first joined UQRFC at the end of the 2012 season. It was a great opportunity to get a feel of the game. When the next season began, I managed to climb up and play for the 4th grade. Our team hit the Grand Final, but unfortunately we came second as runner-up. After all, it was a massive experience for me, to be able to scored 5 tries during the season. UQRFC 4th grade team after winning the semifinal game. Pre-season training. Everyone agreed, the harder you train, the easier you fight. The competition starts early between teammates. The more you train the more chances you get to be selected for the higher grades. So this motivates the players to give their best shot. Progress and Statistic. Beside the coach who track and analyses your progress in every training, the tournament committee also give some valuable statistic of the teams and players performance. A weekly updated competition standings, try scorer and point scorer are recorded to motivate players to evaluate and improve their performance. Expected to always be ready. The game isn’t finish after 80 minutes. We always have to be ready as a back up players for the upper grade team. At least to support. Playing at a historical stadium. It was such an honour to be able to play in a big stadium. Our team went to the grand final and got a privilege to play at the Ballymore stadium, where Wallabies and other national teams used to play. On a personal note, it was an amazing experience, a personal milestone that I would always remember. Career related. Due to my background that’s related to rugby, I got a chance to work in two sports teamwear companies: Tsunami Sportswear and Canterbury. Those prominent companies offered me a job to design rugby clubs’ jersey and other marketing materials. I was very grateful for this experience as it combines two things that I enjoy so much: design and rugby. 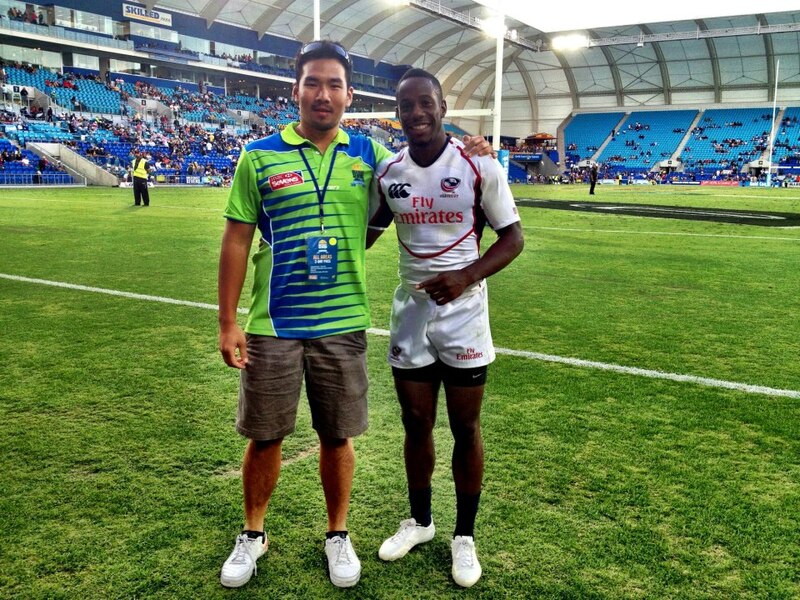 With USA’s Rugby Sevens star, Carlin Isles at Gold Coast 7s. Volunteering in International Event. Not only being able to watch a live international rugby games, I was also able to participate in Gold Coast Rugby 7s as a volunteer. That was once-in-a-lifetime experience where I could watch great rugby games from the sideline (for free as a volunteer), met rugby sevens superstars, and also made a couple of good friends. To sum up, I’d say that two year-long experience of playing rugby in Australia has really provided me with conducive and positive influence. On Sunday, 13 April 2014 the South Australia Indonesian community has once again successfully organised INDOFest, an annual family day event. Hundreds of South Australians attended the event making it one of the biggest cultural community events in Adelaide and the biggest Indonesian festival in Australia. In 2008, INDOFest was co-founded by the Australian Indonesian Association of South Australia (AIA-SA) with the Indonesian Honorary Consul in SA. INDOFest presented a wide range of activities, from workshops, information and retails stalls to cooking demonstrations and kids activities and food and drink stalls. Art performances including gamelan, angklung and traditional dances have always been a hit. It was a really great family event! INDOFest demonstrates a great way to improve people-to-people connections by introducing Indonesian art and culture to wider communities. Also aiming at encouraging the study of Indonesian language and educational links with Indonesia, INDOFest provides a good opportunity for showcasing ‘the best of Indonesia’. Several government institutions such as Ministry of Tourism and Creative Economy, Ministry for Education and Culture, Province of North Sulawesi (Cultural and Tourism agency) took part in the 2014 INDOFest inviting SA communities to not only study but also visit and build connections with Indonesia through trade, commercial business, tourism and even sports. In the midst of challenging time faced by Australia and Indonesia, events like INDOFest which could improve people-to-people connections would remind both countries that opportunities for working together existed, still exist and will always exist. GoLive Indonesia and the Indo-Pacific Governance Research Centre and the Discipline of Politics & International Studies (POLIS) at the University of Adelaide present “A New Seminar Series on Contemporary Indonesia”. The first seminar in the series by Prof. Tim Lindsey, Director of Studies, Graduate Program in Asian Law | Director, Centre for Islamic Law & Society, The University of Melbourne. Prof Lindsey presentation on “The Non-Right to Religious Freedom in Indonesia” will be held at 13:30 – 15:00 on Wednesday, July 31st at Henry Basten Room (104), 1st floor Mitchell Building University of Adelaide. Tim Lindsey is a Professor of Asian Law and Director of the Centre for Indonesian Law, Islam and Society at the Melbourne Law School. He holds a Bachelor of Laws, Bachelor of Arts and Bachelor of Letters from the University of Melbourne and completed his PhD thesis in Indonesian studies. He teaches and researches Indonesian law, shari’a (Islamic law), comparative law and law reform in developing countries. He is the Chair of the Australia Indonesia Institute and practises at the Victorian Bar. His publications include Indonesia: Law and Society; Law Reform in Developing Countries; The Indonesian Constitution; and Corruption in Asia. He is a founding editor of The Australian Journal of Asian Law. Higher education institutions in Australia offer opportunities for their research students to develop their ability and individual set of research skills. This can be done through conducting a research project either full time or part time. One of the biggest constraints that is often faced by many students is that students entering higher degree research programs are assumed to have a complete set of skills and experience in conducting independent research.